Veterinary team members can pursue credentials and certifications in a variety of practice areas, but many of these certifications are not well promoted and therefore not well known. Certifications can help enhance client relationships, compliance, and bonding by promoting career development for team members, improving team morale, and helping team members develop emotional buy-in with the veterinary practice. The following list, although extensive, may not include all credentials and certifications available for nonveterinarians. Team members with special interests should contact academies, societies, and associations to explore further options. Veterinary assistants can become approved veterinary assistants (AVA) or certified veterinary assistants (CVA). These differ not in the knowledge needed but the body that oversees the process. The National Association of Veterinary Technicians in America (NAVTA) hosts AVA credentialing.2 Participants must attend a NAVTA-approved program, graduate from the program, and pass an examination. After passing the examination, AVAs are required to attend 10 hours of CE every 2 years to renew their designation through NAVTA. Currently, VetMedTeam maintains the examination and renewal process for AVAs on NAVTA’s behalf. Several state veterinary medical associations provide CVA certification within their state and offer several levels of certification. Participants must attend an approved program and pass an examination. After passing the examination, CVAs are required to attend approximately 5 hours of approved CE every year (depending on the state) to renew their designation. Currently, Texas,3 Florida,4 Missouri,5 and California6 offer CVA programs. Credentialed veterinary technicians are required to attend and graduate from an AVMA-approved program7 and pass the Veterinary Technician National Examination.8 Depending on the state, credentialed veterinary technicians may also be subject to additional examinations and required to attend CE each year in order to renew their designation. Veterinarians and credentialed veterinary technicians who complete the canine rehabilitation certification program offered by University of Tennessee10 are designated as certified canine rehabilitation practitioners (CCRP). The credentialed technician can then assist the supervising therapist and perform evaluations, maintain patient records, educate clients, and apply prescribed therapeutic exercises and physical modalities. The Canine Rehabilitation Institute11 offers a canine rehabilitation assistant certification (CCRA) for veterinary technicians and a certified canine rehabilitation therapist (CCRT) certification for veterinarians. Is it worth it to calm and quiet the practice, gently handle patients, treat and distract for examinations, and educate clients about pet stress and different ways to teach their pets? WellMPs think so. 30% of survey respondents using low-stress techniques are seeing revenue growth of more than 5%. More importantly, 44% believe these techniques are leading to better medical care. SOURCE: Benchmarks 2016: A Study of Well-Managed Practices. Columbus, OH: WTA Veterinary Consultants and Advanstar Publishing; 2016:25. The International Veterinary Academy of Pain Management (IVAPM)12 offers the certified veterinary pain practitioner (CVPP) designation, which is available to veterinarians and credentialed veterinary technicians experienced in working with patients in pain. The certification is obtained through a rigorous process, and candidates must meet the IVAPM’s standards for education, training, and experience. Once certified, CVPPs promote advanced pain management with the use of multimodalities. The American Association for Laboratory Animal Science (AALAS) technician certification program sets professional standards for the career advancement of individuals working in laboratory animal science. The following designations are currently available: assistant laboratory animal technician (ALAT), laboratory animal technician (LAT), and laboratory animal technologist (LATG).13 LATs with a greater range of experience may qualify for the LATG certification. Several certifications are available for team members interested in animal behavior. Depending on the organization and certification program, any veterinary team member may qualify. Visit each program online to explore specific requirements. Those in management who wish to continue pursuing their education may seek a certificate in professional human resources (ie, PHR, SHRM-CP). The credentials differ not so much in the knowledge needed but rather in the body that oversees the process. PHR is hosted by the Human Resources Certification Institute (HRCI),20 whereas the SHRM-CP is hosted by the Society for Human Resource Management (SHRM).21 Candidates must qualify for the examination with education and experience. 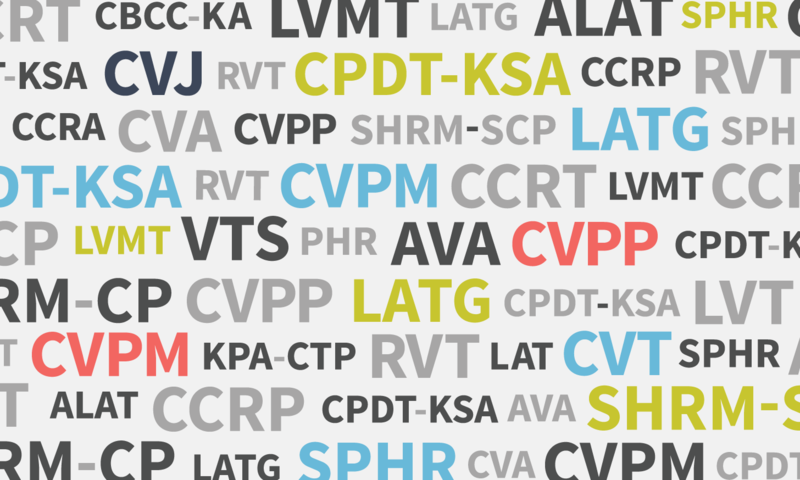 Like the CVPM designation, after passing the examination, designees must meet CE requirements every 2 years to maintain the credential. Team members interested in strategic planning may seek a certificate in senior professional human resources (SPHR or SHRM-SCP). The SPHR is hosted by HRCI, whereas the SHRM-SCP is hosted by SHRM. Designees must maintain CE and renew every 2 years. The American Society of Veterinary Journalists sponsors the veterinary journalist certification (CVJ). This designation was developed to improve the quality of veterinary medical information delivered to the public.22 Both veterinarians and nonveterinarians active in public media, as well as nonveterinarians deeply committed to public education, can qualify. Allowing team members to seek certifications in topics they are passionate about results in personal and professional growth, enabling an enhanced level of client communication and patient care. Leveraging credentialed and certified professionals for client education tasks creates whole team health: happy teams with a great dynamic and work balance and happy clients that value the entire team. 1 Encourage team members to seek certifications in topics they are passionate about to ensure personal and professional growth in the practice. 2 Seek out opportunities for certification by contacting academies, societies, and organizations to discover what other relevant programs may be available. 3 Delegate client education tasks to credentialed veterinary nurses and assistants to appropriately leverage their skills and divide responsibilities in the practice. Difference between credentials and certifications. National Environmental Health Association. https://www.neha.org/professional-development/education-and-training/differences-between-credentials-certifications. Accessed August 22, 2017. Approved veterinary assistant info page. VetMedTeam. https://www.vetmedteam.com/ava.aspx. Accessed August 17, 2017. Certified veterinary assistant training and certification program. Texas Veterinary Medical Association. https://tvma.azurewebsites.net/Certifications/CVA. Accessed August 17, 2017. Certified veterinary assistant. Florida Veterinary Medical Association. https://fvma.org/certification/certified-vet-assistant. Accessed August 17, 2017. Certified veterinary assistant program. Missouri Veterinary Medical Association. http://www.movma.org/?page=CVA. Accessed August 17, 2017. CVMA certified veterinary assistant hospital program. California Veterinary Medical Association. https://cvma.net/careers/cvma-certified-veterinary-assistant-program-2/cvma-certified-veterinary-assistant-program. Accessed August 17, 2017. Programs accredited by the AVMA Committee on Veterinary Technician Education and Activities (CVTEA). American Veterinary Medical Association. https://www.avma.org/ProfessionalDevelopment/Education/Accreditation/Programs/Pages/vettech-programs.aspx. Accessed August 17, 2017. Veterinary technician national examination (VTNE). American Association of Veterinary State Boards. http://aavsb.org/vtne. Accessed August 17, 2017. Specialties. National Association of Veterinary Technicians in America. https://navta.site-ym.com/?page=specialties. Accessed August 17, 2017. Canine rehabilitation certificate (CCRP). University of Tennessee, Northeast Seminars. http://ccrp.utvetce.com. Accessed August 17, 2017. Canine Rehabilitation Institute. http://www.caninerehabinstitute.com/index.html. Accessed August 22, 2017.
International Veterinary Academy of Pain Management [home page]. https://ivapm.org. Accessed August 17, 2017. Technician certification. American Association for Laboratory Animal Science. https://www.aalas.org/certification/technician-certification#.WN5vtxiZPUo. Accessed August 17, 2017. Fear Free Pets [home page]. http://www.fearfreepets.com. Accessed August 17, 2017. Fordyce S, Foote SJ. Low stress handling—from the veterinary technician’s perspective. Cattledog Publishing. https://drsophiayin.com/low-stress-handling. Published October 31, 2016. Accessed August 17, 2017. Karen Pryor Academy for Animal Training & Behavior [home page]. https://www.karenpryoracademy.com. Accessed August 17, 2017. Independent dog trainer certification. Certification Council for Professional Dog Trainers. http://www.ccpdt.org. Accessed August 17, 2017. Veterinary Hospital Managers Association [home page]. http://www.vhma.org. Accessed August 17, 2017. Earning your CVPM. Veterinary Hospital Managers Association. http://vhma.site-ym.com/?page=EarningYourCVPMv2. Accessed August 17, 2017. HR Certification Institute [home page]. https://www.hrci.org. Accessed August 17, 2017. Society for Human Resource Management [home page]. https://www.shrm.org. Accessed August 17, 2017. National Organization of Veterinary Media Specialists and Contributors. American Society of Veterinary Journalists. http://asvj.org. Accessed August 17, 2017.